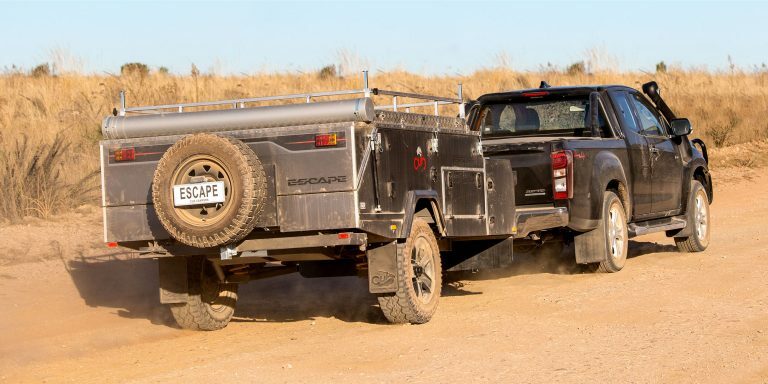 While the camper trailer world has certainly picked up the pace lately, one Australian manufacturer has been quietly sticking to their guns. They say you can’t teach an old dog new tricks, but why should it, if it knows some good tricks already? The Cub brand has been around for a long time, and so have their designs. These days, the camper trailer scene is brimming with new brands and new designs. There’s something to suit all budgets, and something like a Cub that hasn’t really changed in many years could get forgotten. Cub was born from a father-son project back in 1968. JK Fagan, a retired pharmacist, bought a box trailer which then turned into the Cub Drifter, their first camper trailer. The hard roof raised straight up, making room for living space inside. Sleeping areas popped out fore and aft. After that, Cub started making flip-top camper trailers. The roof flips over towards the rear, turning into a hard floor to create floor space. It’s a simple and effective design that has underpinned just about every Cub since. And while the Escape has been freshened up with a new look, some updates and extra accessories, the base of it is still the same flip-top design they have been making for years. The fact of the matter is: these camper trailers work. And they work well. I’ve towed a smaller Cub fully loaded across the Anne Beadell and then back across Gunbarrel Highway, and we lost one shock absorber bush that whole time. Setup hasn’t changed since forever, which is a good thing because it’s dead easy. You pop a handful of latches, then start winding your thingo. Stop at the halfway mark to push it over, and pop some clips along the lower edge of the canvas. Then, tension up two poles inside and you’re done. This basic setup gives you the bed and extra interior space that can be used for kids or when the weather turns against you. For a more permanent setup, pull out the poles and guy ropes and get to work on the awning. Naturally, this takes a bit longer than the initial setup, especially when it’s your first or second go at it. But when you get familiar and learn the tricks, the awning can be done reasonably quickly. 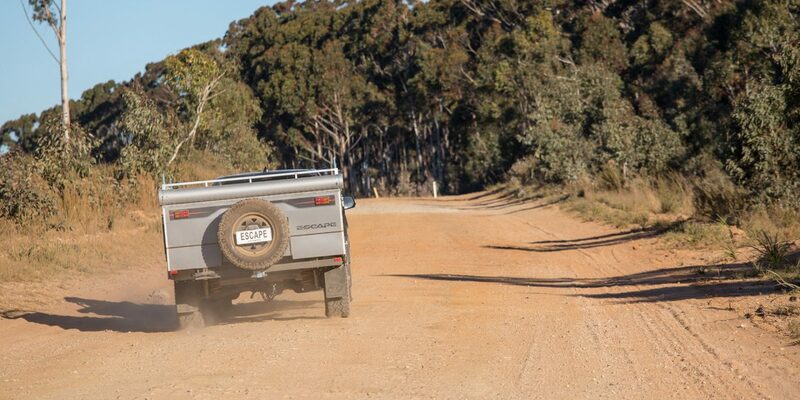 If you’re keen to do some long-range touring, we reckon the Adventure Pack is a great option to look at. You get an extra 80 litres of water storage, using space made available by shifting the spare onto the rear carrier on the back. You also get an extra 100Ah battery, and an upgraded utility rack for gear storage. 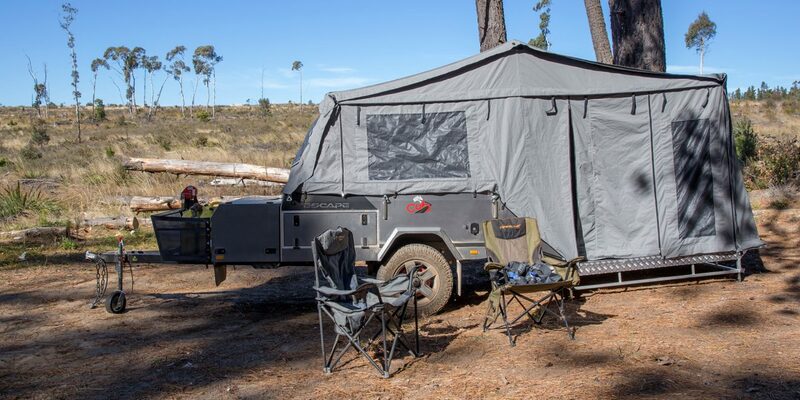 Along with having the comfort and convenience of a bed, kitchen and extra shelter space, the Escape can cater for your water, fuel, food and clothing storage easily. 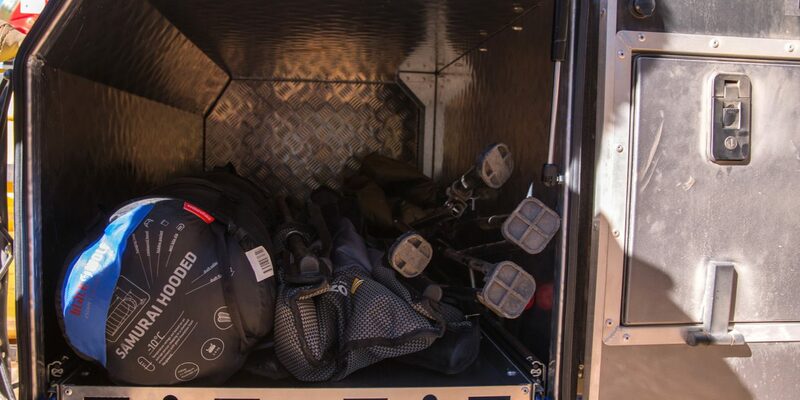 You can lob extra swags, firewood and other bags onto the rack as well without an issue. While we’re talking about size, this trailer is more suited to a larger family, or someone who needs lots of space and gear for long-term off-road travel. An Aussie-made camper trailer is more expensive than an imported one, no doubt. It’s not my job to convince you this is a better option than something cheaper; the whole idea of value and worth is a personal one. I have been to see the production line of Cub Campers at North Rocks, Sydney. Something like a cake, it’s nice to see quality ingredients going in to make a good final product. 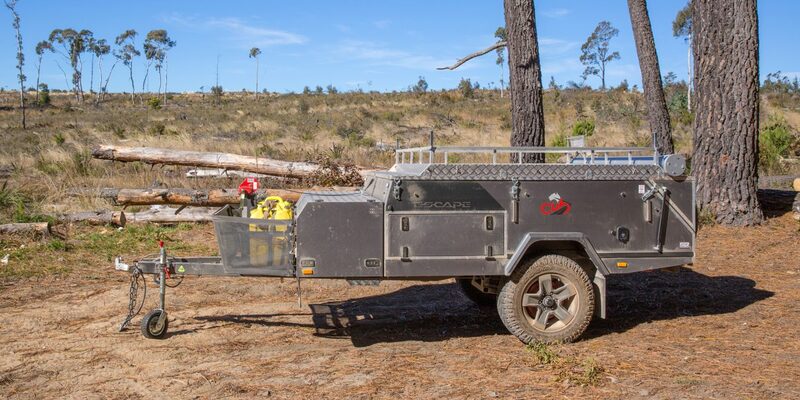 Wax Converters Textiles, the proud bastion of Australian-made canvas, supply their legendary Dynaproofed product for this trailer. Australian steel is locally welded together and hot-dip galvanised for longevity. AL-KO supply brakes and bearings, and the tyres are Goodyear Wranglers. The Cub Escape is priced at $21,990, with a few options available. There are cheaper options out there, and there are more expensive options out there. From experience, I’d back this one to go the distance, and do like the build quality, company reputation and ease of use for living out on the road. We towed this camper trailer with a 2018 Isuzu D-Max. It was an LS-U, in the less common extra-cab configuration. 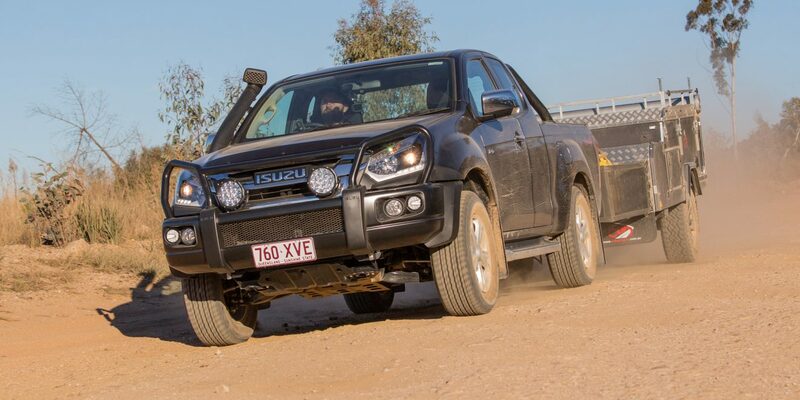 Costing $46,600, the somewhat humble Isuzu does offer a good value proposition along with some solid underpinnings. The engine is their 3.0-litre ‘4JJ1’ intercooled turbo-diesel, which makes 130kW @ 3600rpm and 430Nm @ 2000-2200rpm. The figures aren’t spectacular, nor is the performance. But that’s the strength, at the same time. It’s an unfussed tow rig, that makes short work of weights much heavier than the rough tonne the Cub Escape could muster. The six-speed automatic gearbox is a relaxed operation as well, letting the motor use it’s peak torque band nicely. A 3500kg towing capacity is matched nicely by a 3050kg GVM and 1074kg payload. The GCM is 5950kg, which makes it one of the better options for really loading up and hitting the road. 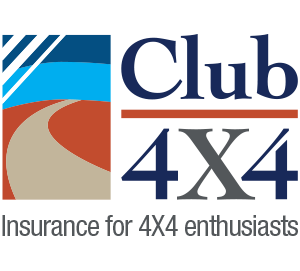 Maxxing out the towing capacity still leaves 2450 of vehicle weight, which leaves a 474kg payload. It’s less than half of the total payload, but that’s the best of a bad bunch compared to the rest of utes that claim 3500kg towing capacities.